before published, some - like the photo at the top of this post of a very young John Vinci working on bringing Adler and Sullivan's crown jewel, the Auditorium Theater, back from death's door - in gorgeous color. If you came out of Christmas with some gift cash or cards, and if you love architecture or Chicago or both, this is an essential volume you'll want to add to your library and pull down from the shelf to revisit again and again. 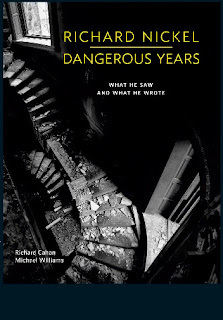 Dangerous Years is much a portrait of the artist and his times as a collection of Nickel's photographs. 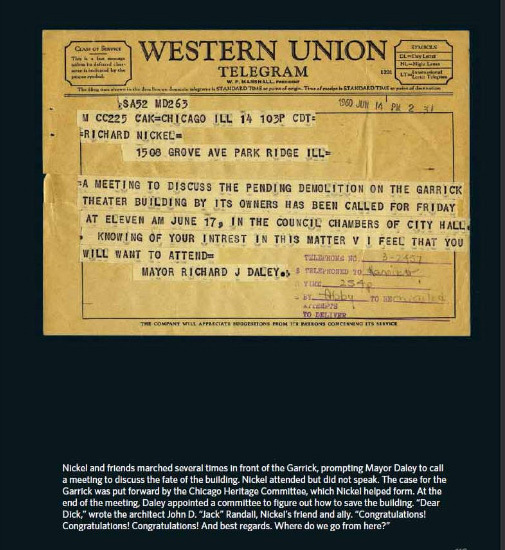 Authors Rich Cahan and Michael Williams have taken an almost reliquary approach to their new book, including not only the pictures of the buildings, but reproductions of the documents of Nickel's life. 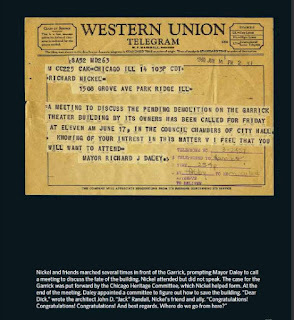 Press clippings, postcards, lists, drafts, angry letters -mundane objects that manage to make the period feel vitally alive - a "To Whom it May Concern" letter written by the Institute of Design's Crombie Taylor to help Nickel get access to buildings; a Western Union telegram from Mayor J. Daley about a meeting in City Council chambers "to discuss the pending demolition on the Garrick Theater building . 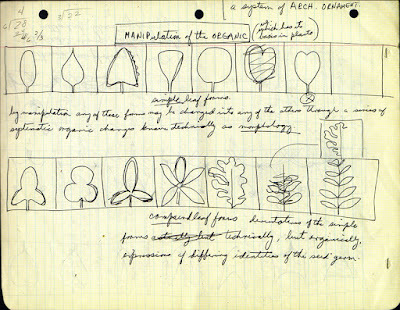 . . "
Not all that long after he described himself as "completely stupid", there's a piece of lined three-hole punch paper where Nickel explores in a series of small drawings the thought process behind Sullivan's ornament. 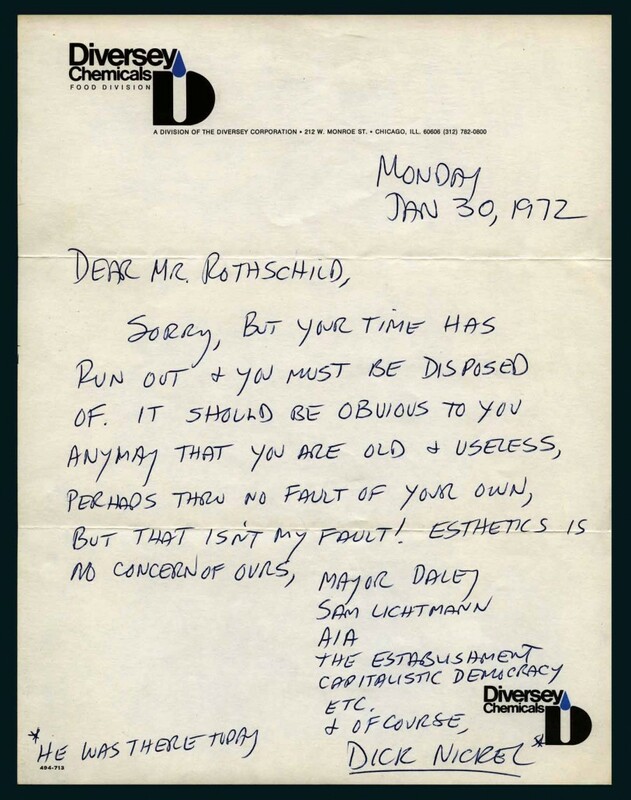 There are daily itineraries, Notes that Nickel took of his 1957 interview with Frank Lloyd Wright "In his opinion, L.H.S got everything from Adler, [and] if it had not been for Adler, Sullivan might never have made the grade of 'Master'". There are photos of Nickel himself, an unremarkable-looking man in glasses of unexpressive countenance, often dressed in white t-shirts. The feeling went into the images he captured, the now classic photographs of a world in anguished death throes, proud and beautiful old buildings spurned and forgotten, hemorrhaging rubble as they await obliteration . . . the gaping maw of the sanctuary of Burnham and Root's Church of the Covenant, split open like a cracked egg. There's also revealing images of buildings, not in the usual idealized isolation, but in their actual context, including a photograph of Frank Lloyd Wright's under-construction Price Tower rising out of a abject streetscape with a gas station and used car dealership in the foreground, the perspective placing both Wright's skyscraper and the gas station's vertical sign in a visual equivalency. There are photographs documenting both the grounds and the cottage Louis Sullivan built for himself in Ocean Springs, Mississippi, destroyed by Katrina in 2005. You want there to be a take-away, some inspirational message to be drawn. But history always confounds. And what is history? The expression of power through people and events. And the story of Richard Nickel is a time capsule of a shifting paradigm moment in American urbanism, in deep concentration on the city's South Side. In the 1940's, postwar Chicago had another word for the city's architectural heritage: The Slums. As Afro-Americans poured into the city during the war, they formed a burgeoning "Black Belt" that swelled to take over former white neighborhoods east of the railroad tracks on Chicago's South Side. It was among the twenty-three square miles the city had designated as "blight", said to threaten another 56 square miles adjacent, altogether more than a third of Chicago's land mass. The feds had the money, and the city had the plan: destroy it - all of it. Create a tabula rasa for new development so destructed that it reminded a visiting Englishwoman of London after the German bombing raids. Much of what was destroyed only grew into being slums; proud old buildings built for the middle and upper class, now deteriorated through neglect and misuse. 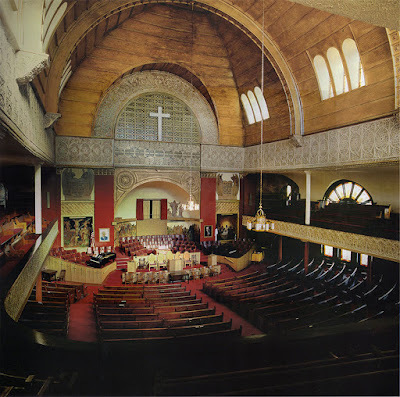 Within a single half-mile, there were 19 houses designed by the firm of Louis Sullivan and Dankmar Adler for wealthy Jewish families. 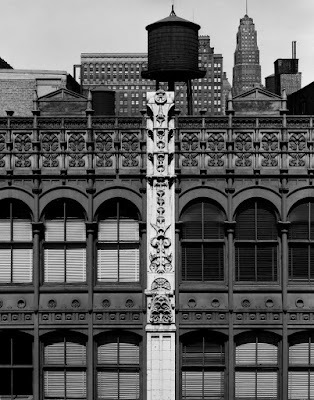 In booming turn-of-the-century Chicago, Burnham and Root and Holabird and Roche were the architecture firms of power, getting the big commissions for the huge office buildings that would come to define the Chicago School of Architecture. They were the brains and the muscle. Adler and Sullivan were the heart. Most specifically Louis Sullivan, the iconoclastic genius who had no problem combining high commerce with high art, expressing the compressed energy tightly contained within the new commercial buildings into spectacular ornament bursting forth from the plain facades. By the mid 20th-Century, however, Miesian modernism had begun its triumphant ascent, and Sullivan was out of fashion, an antique. He had died in 1924 in a hotel room made out of a broom closet, a broken alcoholic, reduced in his final years to not especially lucrative commissions for small-town banks, works nonetheless so exquisite that their veneration increases down to our present day. Mid-Century Chicago had neither the patience nor the interest for such curiousity. To the planners, what a building had been - or could be again - was unimportant. All that mattered was securing their antiseptic visions for the future: pristine towers rising from sprawling gardens - or parking lots. 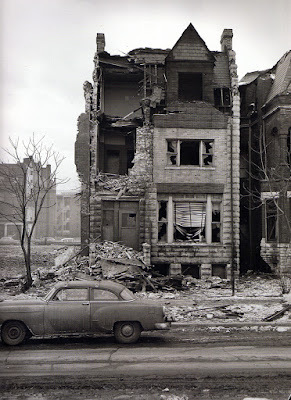 What took place en masse on the South Side was also taking place in Chicago's commercial core, building by building. Chicago's globally recognized architectural heritage was being decimated landmark after landmark for new, often numbingly mediocre towers. Or worse. Adler and Sullivan's spectacular Garrick Theater building, which combined an auditorium with a soaring early skyscraper, was proposed to be destroyed for a parking garage. Into this mix came a young man born in Chicago to working class second-generation Polish Americans - his father drove a delivery truck for the Polish Daily News. Like most young men of the era, Richard Nickel joined the army after high school, and afterwards returned to Chicago with a Rolleiflex camera he bought while serving in occupied Japan. He enrolled in the Institute of Design, founded by László Moholy-Nagy, a refugee from the famed Bauhaus in Germany. Nickel learned photography from Aaron Siskind and Harry Callahan. Eventually he would earn both bachelor's and master's degrees. Around 1953, he was asked to join a Siskind project to create "a 'definitive' study of the architecture of Adler and Sullivan. Nickel probably didn't realize it at the time - he described himself as having "no feelings about architecture - knew nothing about Sullivan - in shirt, was completely stupid", but joining that class would define - and control - his short life. 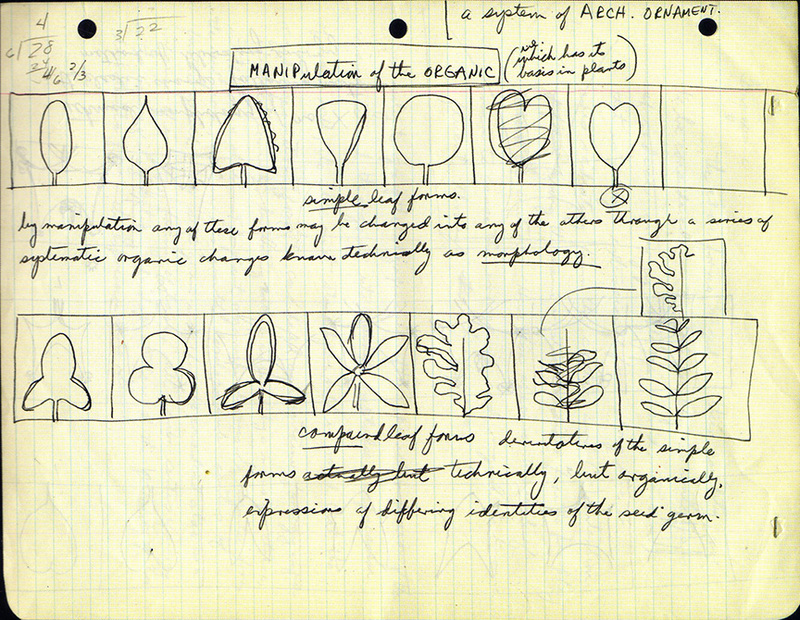 The study was shopped around to potential publishers as a book, The Complete Architecture of Adler and Sullivan. But the records of the firm had been destroyed, the scope of the work unknown, with individual buildings disappearing almost weekly. Although he would never complete the book, Nickel threw himself into the research, scouring old architectural magazines and engaging building owners in correspondence. 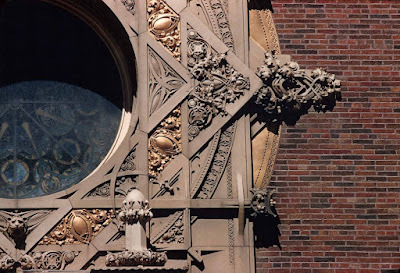 Obsession or habit, Louis Sullivan became Richard Nickel's life. And it began to go beyond documenting to advocacy. Almost single-handedly, Nickel jump-started the architectural preservation movement in Chicago, organizing picket lines protesting the demolition of the Garrick. 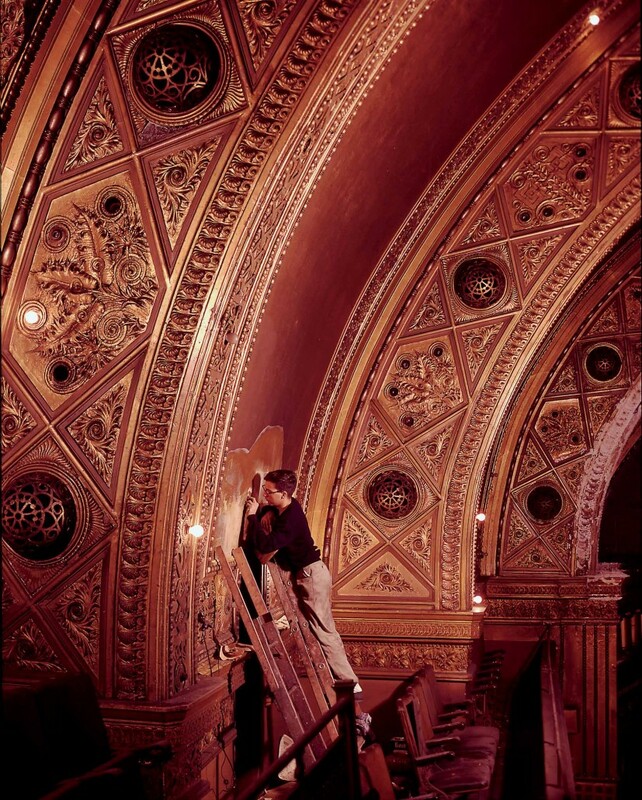 He developed relationships with owners and wreckers to salvage ornament from buildings being bulldozed, often in physically hazardous circumstances, often only with the help of an equally young John Vinci and Tim Samuelson. Nickel became a ruthless archivist, forcing himself to rise again one lost battle after another. He broke through a sixteen-foot wall of an Adler and Sullivan building under demolition to get at a vault he was told might contain photographs and blueprints. Finding only real estate plans instead, he remarked, "The story of my life, struggling over nothing." 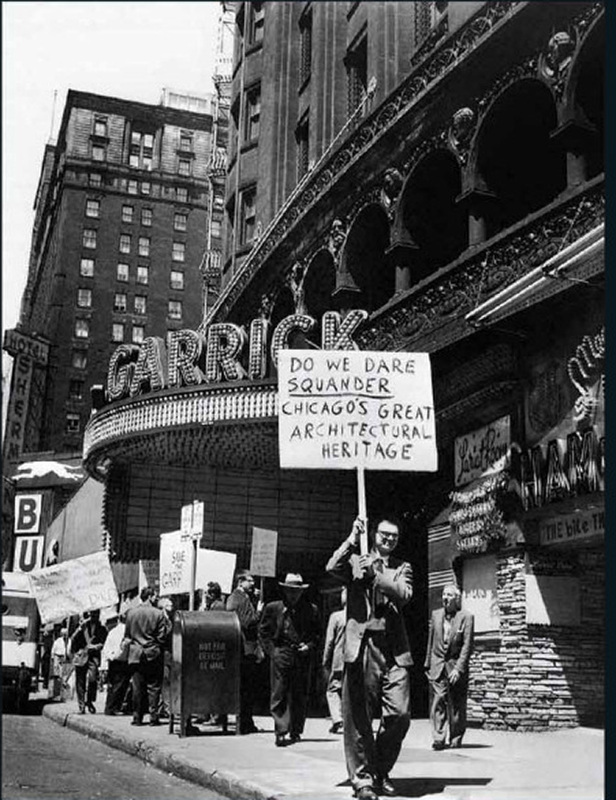 Nickel lost the battle to save the Garrick, but the city created the Commission on Chicago Landmarks to make sure it didn't happen again. And then let it happen again when it cleared the way for the destruction of another extraordinary Adler and Sullivan masterpiece, the Stock Exchange Building. Nickel wanted to save things, but his most enduring work is a necrology. He created a photographic documentary on the willful destruction of a city's history. Attention to Nickel seems to take on a kind of Brigadoon quality. Every few years a new book appears, and then disappears from sight. Cahan's acclaimed 1994 biography, They All Fall Down: Richard Nickel's Struggle To Save America's Architecture, is listed on the publishers website as "out of stock". 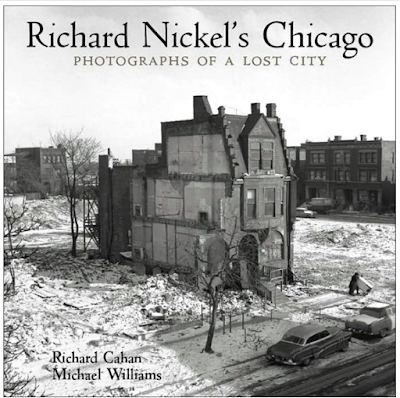 CityFile's 2006 Richard Nickel's Chicago: Photographs of a Lost City is listed as "sold out", with new copies on Amazon going for multiples of the cover price. The story of Richard Nickel has become a passion play on the divide between our ideals and how we actually live our lives. It's become almost a narrative of ritual sacrifice, the story of a working class schlub who unlocked the secrets of the sublime and knew its servant, Sullivan, better than anyone else, but who, in the end, simply chose to know the wrong things, and was cast adrift in a world where all the best people - the rich and powerful and the far larger number of us who aspire to be both - prudently chose to learn the right things, the practical market driven things that make Nickel's obsession, however admirable, ultimately naive and pathetic. At a point of despair, Nickel, whose love of the water had led him to become an accomplished sailor, quotes from Benjamin Britten's opera Peter Grimes, where the old sea captain Balstrode, sympathetic but wise to the ways of the world, advises Grimes, driven mad from the pressures of his own nature hounded by the venal, uncomprehending mob, on what is now the tormented fisherman's only way out . . .
. . . lose sight of land, then sink the boat. D'you hear? Sink her. That was Richard Nickel's life. His struggle. He had his time, and then it ended. And now we have his work, his obsessive work, that has grown in importance and recognition, and finds a kind of apotheosis in the remarkable, poignant, often deeply personal images of Richard Nickel Dangerous Years. "Stock Exchange is a scandal and a tragedy beyond words . . ." Nickel had written. He worked for three months on rescuing the great Trading Room, painstakingly restored and rebuilt by John Vinci inside the Art Institute of Chicago, a stunning ghost of almost unbearable beauty, a perfect shrine unmoored from meaning. 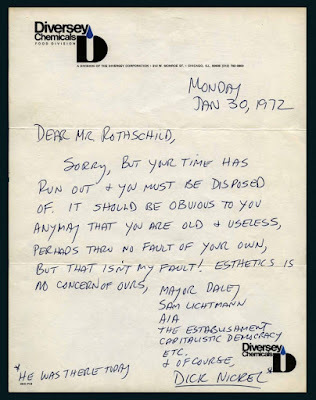 And then, in early 1972, Nickel wrote to Samuelson a startling confession, "I'm afraid our days of adventuring, salvaging, avoiding the cops, etc. in the cause of Sullivan will soon terminate. 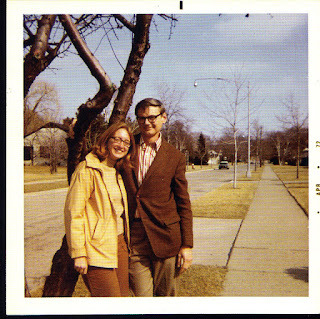 For me anyway, since I plan to marry Carol sometime this spring summer . . ." At age 43, Nickel had fallen in love, to 33-year-old Carol Ruth Sutter. "She's crazy about me and I figured the least I could do was reciprocate." A newer, freer, more domestic Nickel emerged from the decades of obsession. A new person appeared to be coming into being. But not before one last excursion to the Stock Exchange to retrieve more ornament. The demolition workers who watched him enter the building were the last to see him alive. Reported missing the following evening, it would take over a month before his body was found under rubble that had collapsed into the structure's basement. For us, the meaning of Richard Nickel's life is the amazing body of work he left behind. For Richard Nickel, did it all boil down to that sliver of grace when he finally found love? My question to the writer of the blog would be: If he "simply chose to know the wrong things," what SHOULD Richard Nickel have "chosen" to know in order to combat a culture-wide zeitgeist that allowed the destruction of these great works of art from another era? How can one person, just by knowing - for instance - how the rich and powerful operate, or by understanding what they have devoted their lives to - the accrual of power and wealth - how can ONE PERSON change an entire value system that, in the intervening years since Nickel's death, has caused untold human suffering by enshrining the "bottom line" as the over-arching value of every aspect of our public and private lives? According to this blogger's given value system, "right" equals a specific kind of efficaciousness, and "wrong" is the passionate appreciation of great art. It seems to me that he is judging Nickel's life-work by the very same standards that underlay the decisions of those who destroyed all those buildings by Sullivan and Alder. "Bottom-line-ism" is what I call it. No, ultimately, the "naive and pathetic" are the ones who, according to the writer, "prudently chose to learn the right things, the practical market driven things." Yes, the very things that are destroying our society and our environment. I think you've completely misread the paragraph. It's clear that the writer is describing the narrative surrounding Nickel's cultural context. Not condemning Nickel himself. I believe you are arguing with someone who agrees with you.